This month, as I strive to not buy unnecessary things, I’m trying to be content with what I already have. I have started to see greater potential in things currently in my home, finding ways to get creative and repurpose items that have been overlooked or underutilized. This way, I can change things up when I want to while avoiding big hits to my wallet. As my sister and I are hoping to find a new place to live, we’re taking this transition as an opportunity to look through the things we currently have and create a space that better reflects our personalities and what we want our home to look and feel like. We’ve both collected various items over the years that don’t necessarily represent who we are or how we want our space to function. We have picked these things up at thrift stores because they were cheap, gotten them as well-intentioned gifts, or even purchased them because we liked them at the time, but have since grown out of them. The result is an apartment full of mis-matched things that we’re not so crazy about. So begins yet another pile of items to be donated. Hoping we’ll have a new home to call our own and decorate in whatever way we wish gives us a blank slate, an opportunity to start over in a way.As twenty-somethings, we don’t have much dispensable income (especially considering the fact that we’re looking to move), so we’re getting creative with what we have. Knowing there are some treasures hidden in the clutter we’ve accumulated, we are also brainstorming ways to create a space that does suit us better. My sister is really good at repurposing things, and I’m working on channeling her creativity and artistic eye in transforming old, ignored pieces into true treasures. I began by taking a look around my room and my apartment to see what could use a little sprucing up. I also took inventory of what supplies I had on hand, both so that I can make sure I use them up in an effort to not accumulate too much, and to save money when possible by using what I already have. I knew I didn’t need to go out and buy all-new decor for my home to make it look and feel the way I wanted to; there certainly were things I wanted to change, and I set about trying to do it creatively. When I purchased a new bed and bedding set a month ago, I told myself I was going to work to create a more cohesive color palette and decor theme. Instead of seeing such a wide array of miscellaneous things that don’t go together, I wanted to work to make things feel like they really fit and belong in the space. I drew inspiration from Pinterest, of course, to find some DIY projects that wouldn’t break the bank, and my sister and I quickly put together a board full of fabulous ideas for our next home! Some things will have to wait until we have a new space, but there are others that I can try my hand at now to get a head-start on creating a unified, relaxing, calming space of things that I love and things that really fit well together. 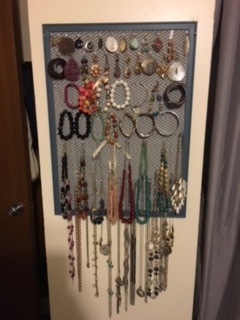 I recently re-made my jewelry board that I didn’t want to get rid of but kept thinking was a bit of an eyesore. 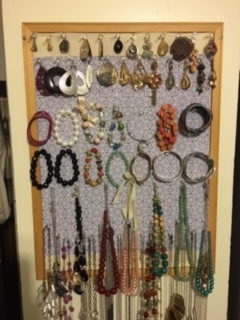 So I began by painting the frame of my jewelry board (just an old bulletin board) and recovering it with fabric that actually matches my room instead of the purple floral linen I had used when I made it a few years ago. I had the new fabric and paint already, so I didn’t have to spend any money on the project, and it fits much better with the other things in my room now (including a large picture frame that I updated with new scrapbook paper to mat the photo, tying it in to the other pieces I have in my room). Of course, this little one-evening project got my wheels turning about what else I can do to transform my space. I have already come up with a list of small changes I can make, and I look forward to slowly seeing my room come together as I cross them off the list. There’s a special feeling of accomplishment when you see your hard work pay off, and I think handmade items add a certain touch that store-bought pieces just can’t measure up to. What kinds of things have you repurposed? When have you used your creative talents to transform a space? Do you have any suggestions for making your house feel like a home on a tight budget? I’d love to hear them!